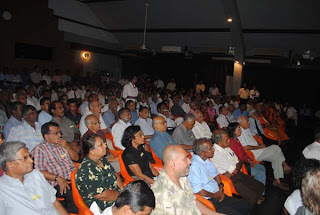 Major General Shavendra Silva explained how Army's 58th brigade eliminated the ruthless terrorists and rescued the innocent civilians held hostage in the environs of the beautiful Nandikadal lagoon in the last battle against the LTTE terrorists, in a rare talk delivered at the Mahaveli Centre Auditiorium yesterday. Addressing the Royal Asiatic Society members the Major General said the Tiger leader died like a pussycat by the side of Nandikadal mangroves. At the time the last phase of the battle against the terrorists were raging the whole country aligned themselves with the valiant soldiers who were first simply known as Army Karaya became known as Ranaviruwa in the eyes of the public. It was the leadership of this country that gave the Armed Forces the support they needed both in logistics and innovative methods to cope with rains or drought. Everything the Army did depended on the country's leadership, the Maj General noted. 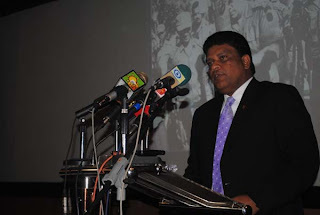 The Tiger leader not only assassinated the Sinhala political leaders but also the Tamil political leaders culminating in the assassination of Indian Premier Rajiv Gandhi. Showing slide displays of the large scale sabotage by the terrorists, the 58 Brigade Commander Major General Shavendra Silva said the terrorist group killed people of all ethnic groups and all religions mercilessly. The mass media played a vital role supporting the forces from behind the scene. The longest ever trek made by the Sri Lanka Army 58th brigade was a path that was strewn with mines and booby traps over two hundred kilometers till the final victory over terrorism was achieved. It also did the world's biggest humanitarian rescue operation and we made history, he said. All these victories were not achieved easily but with supreme sacrifice made by a large number of our youth who had joined the Armed Forces from the poorest of the poor families. Some gave their sight, some their limbs some became completely disabled for life, Maj Gen Silva recalled. He said there was no fear in the battle but everyone was aiming at the same objective. When there was rain civilians sent us tarpaulins, when there was heavy rain Defence Secretary Gotabhaya Rajapaksa sent heaters to dry the soldiers uniforms. Everyone cooperated with the Armed Forces and it was country's leadership that made the decisions promptly and at the correct time that enabled us to win the war against terrorism.